When our brokers sit down to discuss insurance coverage for a company that is in the construction industry, one of the most challenging segments to find General Liability Insurance Coverage for is a Las Vegas/Clark County, NV Roofing Contractor. Being a Roofing Contractor carries very specific risks that, for the most part, are not associated with other various contracting trades. That increased risk brings a corresponding high rate of expensive claims that are not shared by the other artisan trades such as Electrical, Plumbing, Carpentry, or Concrete. Whether your roofing company is just starting out, or it has been in business for years, and you are looking for roofing general liability insurance coverage, PJO Insurance Brokerage can add value to your company because of our long history of providing General Liability Insurance coverage for Roofing Contractors with our access to top flight insurance carriers that offer Las Vegas/Clark County, NV Roofing General Liability Insurance, so your company can be assured of having the proper insurance coverage for your roofing company as well as superior customer service. In general, the Roofing General Liability Policies carry standard limits of one million per occurrence and two million aggregate. If your Las Vegas/Clark County, NV roofing company performs work on commercial projects, apartment buildings, or high-end custom homes, we highly suggest that your company seriously consider adding additional insurance coverage to your overall program in the form of an Umbrella/Excess Liability Policy. This type of coverage will go over your Las Vegas/Clark County, NV General Liability Policy. As you are very aware, without the proper roofing liability insurance coverage in place, your Las Vegas/Clark County, NV Roofing Company may experience significant financial losses in the event your company was held liable for a claim filed successfully against your roofing company. By already having in force, Las Vegas/Clark County, NV Roofing General Liability Insurance, your company can be protected in case there is a claim or lawsuit filed against your company. In addition, it would be beneficial to your company to also have workers’ compensation insurance to protect your employees. By acquiring a Las Vegas Roofing General Liability Insurance Policy, if there is a lawsuit or claim filed against your roofing company, the insurance carrier will investigate the claim and provide legal defense for the claim against your roofing company. Your company will appreciate having Roofing General Liability Insurance Coverage, since it will make navigating through the claim’s process much easier and less costly to the company. There are many factors that are used when determining what the premium of a Las Vegas/Clark County, NV Roofing Liability policy will cost. The insurance carriers will base their premium on either your payroll and sub-contractor costs or on gross receipts and sub-contractor costs. To make sure that you ensure your company receives the best quote, we highly suggest that your roofing company obtain an insurance quote with both options. In addition, when the insurance carriers look at determining roofing general liability premiums, there are many factors that are considered in the process. Among the various items that will factor into your Las Vegas/Clark County, NV roofing company’s quote will be what percentage of residential and/or commercial roofing are performed. The insurance underwriters will also look at factors including whether or not your roofing company does foam roofing, hot mop application, torch-down application, apartments, flat roofs, buildings above three stories, new custom homes or tract housing, along with how long your company has been in business and its years of roofing experience. If your company has been in business for at least three years and has had no claims, these factors will be a plus when it comes to pricing the insurance premium. As you can see, there are many factors that are considered in the process of acquiring a Las Vegas/Clark County, NV Roofing General Liability Policy. 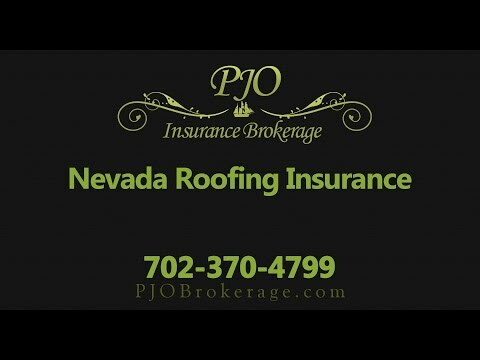 If your roofing company would like to discuss roofing insurance options for your Las Vegas/Clark County, NV company, please contact the experienced and professional brokers at PJO Insurance Brokerage. With our access to numerous quality insurance carriers, we can assist you in finding the proper insurance coverage for your company.